There are 4 complete loops connected by the gravel road. The 4th loop goes to the expert Boulder section, with a bypass around it. Review: Half short, punchy sections that have you picking your way through rock gardens and pointy rock minefields and half smooth flowy single track, this is my current favorite trail. You can follow the sections in order (hint: section 8 is the starting spot so don't be confused) or just follow the gravel road and piece it together - either way is fun. Only 6 or 7 miles, but it's a serious 6-7 miles. My arms were sore the next day! Review: challenging trail - would call it a respectable blue with hint of Black flavor- keeps you on your game. Like the plastic like berm. Review: I'm new to mountain biking. 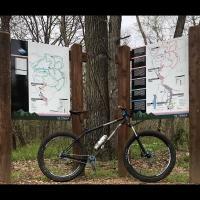 Lake Ponca Trails is a fun park to ride in. Lake Ponca Trails in one of many outdoor activities around Ponca Lake. Enjoy MTB, boating, fishing, swimming, and camping. There's always a game or two of volley ball going near the swim beach. Review: This is a great, technical trail. Advanced intermediate skill level. A lot of rocks! Lake Ponca Trails MTB Trail 5.00 out of 5 based on 7 ratings. 7 user reviews.